With Father's day approaching I felt it fitting to share the dedication from Positive Discipline. I became pregnant with my sixth child while working on my master’s degree. The University I attended was 50 miles from home. Because I deliver babies so quickly, and often early, during the last month Barry drove me to school (with our emergency birth kit in the back seat) and sat in an empty classroom while I attended classes. Mark was born during Christmas vacation. I love to nurse, so when school reconvened, Barry continued driving me and our nursing son the 100 mile round trip to school. He would then sit in an empty classroom with Mark so I could nurse during breaks. When our nursing babies cried at night, Barry would get up, change their diapers, and bring them to me to nurse. He could hardly remember getting up, but when I got up I had difficulty going back to sleep. After Mary was born (three years later) Barry and I both considered going back to school for advanced degrees. It was obvious that we could not both go to school since we had two children under the age of five. It was Barry’s decision that I should go since I love school and he doesn’t, and that he would prefer to be home every evening (after his full time job as a civil engineer) with the kids while I pursued my Ed.D. and spent a lot of time studying. People often ask me how I am able to do all that I do. Now you know -- and you have a taste of why I love and appreciate him so much. The above dedication is from the Positive Discipline Audio Book. The first chapter of this Audio Book is available for free download at http://focusingonsolutions.com/. 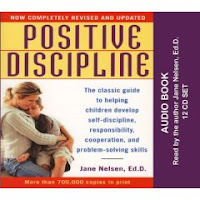 I am very excited about the release of the 12 CD Set Positive Discipline Audio Book. This has been a project I have wanted to complete for over 20 years. Many people who work full time, like many fathers, do not have spare time to read. Now Those people can have the benefit of Positive Discipline with ability to listen to this audio book in the car while they commute. Thank you so much to my son Ken who has made this possible.